The average UK citizen has about five credit cards and an average balance of £9,000. There are more than 670 million credit cards in circulation in America. About 55 million people pay off their balances every month whilst 115 million do not. The other 500 million cards remain unused. The American credit card industry makes an overall profit of anything up to £25 billion ($50 billion) a year from APR interest charges alone. Last year more than 7 million people declared themselves bankrupt in the USA. Bankruptcy is the term given to people who declare all of their unpaid balances from loans and credit cards un-payable and is a serious issue. Once you have declared yourself bankrupt, it's unlikely you'll ever be able to get hold of credit again. Personal bankruptcy rates during the late 1990s soared to nearly ten times the rate during the Great Depression, peaking at 1.4 million in 1998. Consumer credit card debt is rising, fast! In the 1980 American consumer debt was estimated at $50 billion. In 2008 it is estimated at more like $7 trillion. The first modern credit card was introduced in 1949 by Frank X. McNamara and was called 'Diners club'. The first Diners Club credit cards were given out to 200 people (mostly friends and acquaintances of McNamara himself) and only accepted by 14 restaurants in New York. The concept of the card proved popular and grew fast. By the end of 1950, 20,000 people were using the Diners Club credit card. In the past, credit card users would carefully consider purchases and primarily use credit cards to make purchases they knew they would soon be able to cover financially. More and more modern day consumers of credit simply make purchases with credit cards without even considering paying back the money! Unlike mortgage repayments, credit card payments are not tax deductible. The vast majority of credit card companies only require consumers to pay off a monthly minimum, almost always set at 2% of the total balance owed. This may seem like a good deal, but every time you pay off the minimum requirement, the APR racks up more points against your balance, increasing your overall debt. If you pay your bill in full and on time each month, no interest has time to accrue. Most credit card companies have a grace period of about one month, which is the length of a credit card billing cycle. During this time, no interest is accrued on new charges, although old charges will continue accruing. Credit card companies have names for different categories of consumers, depending on how often they use their credit cards and whether they pay their bills on time. "Revolvers" are people who roll credit card balances over month to month, never paying in full. "Deadbeats" pay their balances off in full every month. "Rate Surfers" or "Gamers," switch credit cards based on where they can get a lower APR. 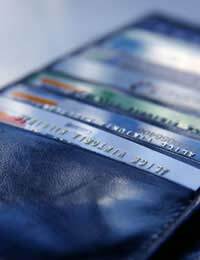 Credit card companies have a range of ways to make more profit from your balances. Perhaps the sneakiest way is through a regulation called "universal default," which allows credit card issuers to increase your APR by as much as 20% or higher if you have missed a payment on another unrelated credit card. Issuers can also jack up your APR if they think your balance is too high on another card, of it they "find out" that you missed a payment on an old card. Unfortunately, there is nothing consumers can do about this because the "universal default" regulation is legal.